Roasting romaine sounded strange to me the first time someone suggested it. After all, the quality I like most about romaine is its crispy texture. I was not at all sure roasting romaine was a good idea. When I got around to trying it, I was sold. Roasting brings out the natural sugar in romaine as well as the other vegetables in this salad. Also, the flavor become more concentrated and intense. 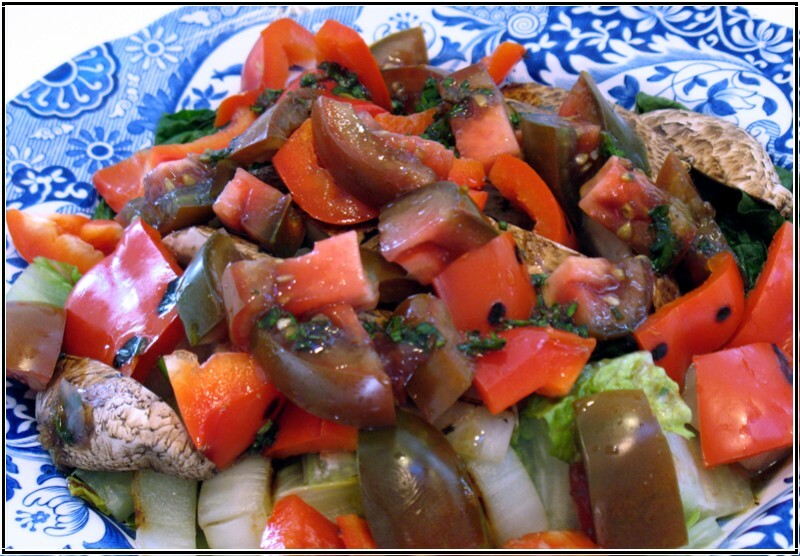 The medley of onions, red peppers, portabello mushrooms and tomatoes mixed with romaine creates a satisfying salad. Before serving this salad, drizzle the vinaigrette dressing over the top. I enjoy this salad for its taste, buy I love it for its color and texture. Most of all, I know this salad is good for me. That makes me happy! A warm medley of chunky vegetables can be served as an entrée or a first course. The roasting process boosts the flavor. 1. Remove stems from mushrooms and brush them clean. Place onto hot grill or hot dry frying pan over high heat and roast for 3 minutes on each side. Remove and set aside. 2. Place romaine lettuce, cut side down, on a hot grill or a hot dry frying pan. Roast for 1 1/2 minutes on each side or until lettuce has grill marks. Remove from pan and set aside. 3. Grill bell peppers, turning every minute until grill marks appear on each side. Grill onions turning 30 seconds on each side. Set aside. 4. All vegetables should have grill marks on the outside, but remain slightly raw on the inside. 5. Combine olive oil, Tuscan Lavender Seasoning, and balsamic vinegar. Set aside. 6. 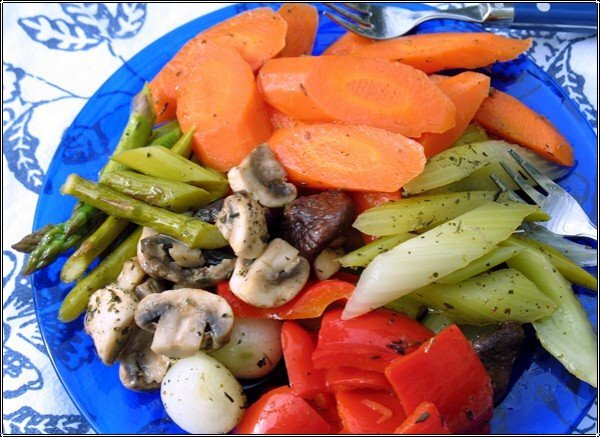 Cut roasted vegetables into large chunks and place in a salad bowl. Add tomatoes and dressing, and toss lightly.